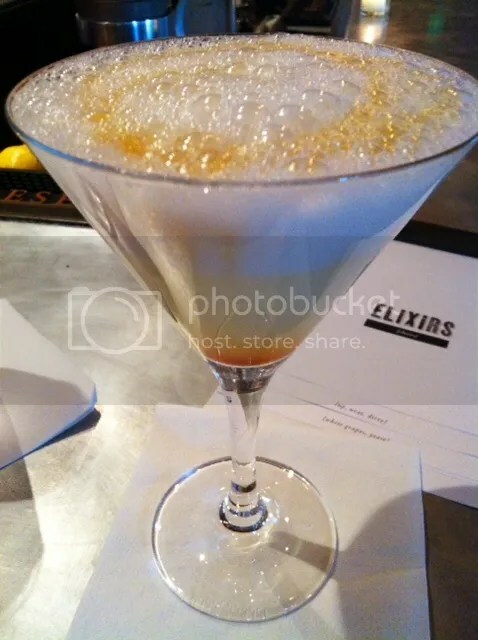 Forgive the confusing post title; I’m just running with the theme at Ela, where all their cocktails are named after songs by the band, Brand New. 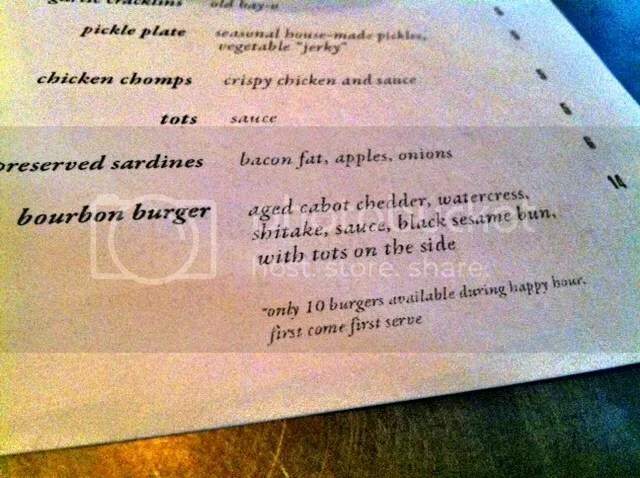 I’d been meaning to come to Ela for some time now, mostly because they have an elusive burger that is only offered on their happy hour menu Tuesday-Friday and they only make 10 of them a day. 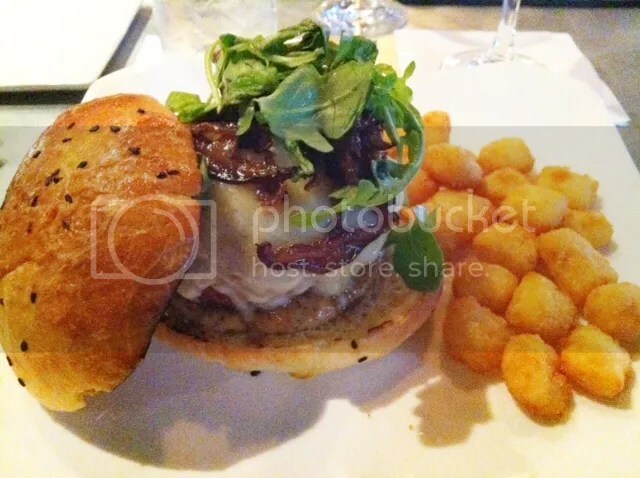 Made from house ground sirloin and short ribs and topped with aged cabot cheddar, watercress, shitake, sauce and a house black sesame bun that’s baked an hour before serving, the Ela bourbon burger is as rare as a four leaf clover! I also got 2 of the pop-punked themed drinks off the ELIXIRS menu as well: The “Last Chance to Lose Your Keys“, which had tequila, rosemary, kaffir lime, citruses. I didn’t really like it. Maybe it was the kaffir lime and rosemary combination, but it tasted a little too chemically to me. And it was gray. I don’t know about you, but that’s about the least appealing color I want to see in a cocktail glass. I also got the “Jude Law and a Semester Abroad“, not just because that’s one of my favorite Brand New songs, but because it sounded delicious. It had gin, burnt sugar, absinthe and lemon in it – absinthe rinse on the glass and then it appeared that the gin and lemon were already mixed because the bartender squeezed it out of some kind of seltzer bottle into my glass and waited for it to settle. (That’s where the foamy bits come from) Then she topped it off with the drizzle of burnt sugar. The effect was pretty cool and it tasted great; I just wish that there had been more actual liquid in the drink. I felt like I was getting nothing but foam at the first few sips. I’d definitely love to come back and check out the rest of the drinks, as well as their regular food menu. The couple next to me were doing the chef’s tasting and everything that came out looked amazing. PS. Rumor has it they will be rolling out the burger on their new brunch menu this Sunday so you won’t have to run to happy hour just to get it (but you’ll still want to because, c’mon guys, it’s happy hour). 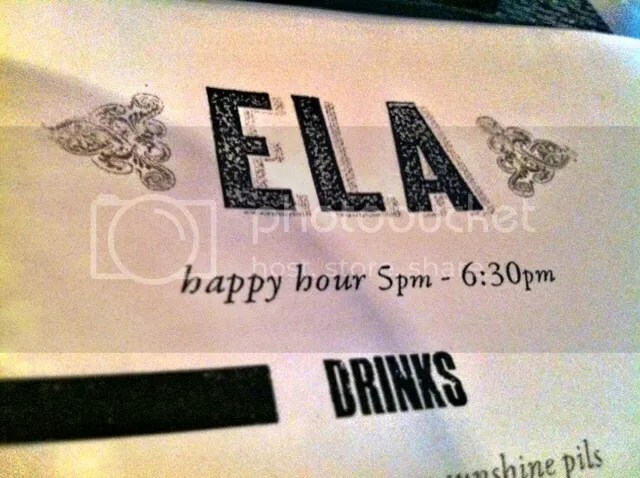 Posted in burger, ela, happy hour. Bookmark the permalink.